Glacier National Park Archives - Go Northwest! 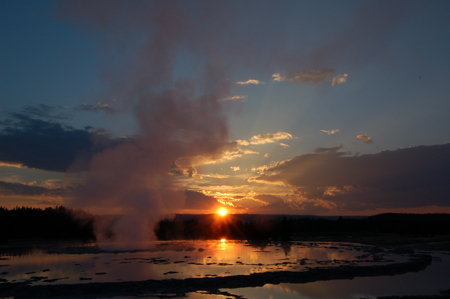 The Great Fountain Geyser of Yellowstone National Park is a favorite location for photographers wanting to capture a colorful sunset. The geyser, which erupts to heights of 75 to 150 feet every 8 to 12 hours, is located on Firehole Lake Drive between Madison Junction and Old Faithful. You can expect to have a lot of company at this spot due to its well-know popularity. The geyser erupts to heights of 75 to 150 feet every 8 to 12 hours. This entry was posted in Glacier National Park, Montana and tagged Firehole Lake, Great Fountain Geyser, Old Faithful, Yellowstone, Yellowstone National Park on September 24, 2012 by Jack High. You already may know what I have just learned: The view of Wild Goose Island in St. Mary Lake with the craggy peaks of Glacier National Park in the background is perhaps the most photographed spot in the entire park. I was doing a photo shoot of the park under the tutelage of John Reddy, a professional photographer I had hired out of Helena, Montana. John and I had met a couple of years before at a photography workshop in Yellowstone National Park and I was looking forward to learning all I could about landscape photography from John. We arrived at the Wild Goose Island “official photography turnout” and viewpoint before dawn . . . and before coffee, but not before the first photographer to arrive. Heavy clouds lingered overhead but a glimmer of light in the eastern sky suggested we might be in luck for a decent sunrise. We weren’t disappointed. We set up our tripods alongside the first arrival, mounted our cameras, chose our lenses and checked our camera settings all in preparation for the first light of the morning. I clicked off my first exposure at 4:40 AM, a test shot and patiently waited for the show to begin. Slowly and steadly other photographers began to arrive and before the first rays of sun painted the scene there were more than a dozen of us there from all parts of the country clicking away. And these were serious photographers with serious equipment. By 5:59 AM, I had clicked off 53 shots using various focal lengths, lenses and exposures and felt satisfied I had accomplished what I was after. Most of the others also had gotten the shots they wanted and we all drifted away from the spot, boarded our cars and moved on to other locations or activities. So how popular is the Wild Goose Island viewpoint? This morning I Googled the phrase and was surprised to see a number of links all leading to photos, one of which had been posted just yesterday and recounted the photographers encounter with a Grizzly. Almost at the same time I glanced over at my copy of Moon Handbooks Montana and there on the cover was a beautiful shot of this now very familiar scene. Should you want to go, you’ll find the turnout and viewpoint alongside the Going-to-the-Sun Road just a few miles west of the town of St. Mary, Montana. Here are the GPS coordinates as recorded by my camera when taking the above image: N 48, 41.499; W 113, 31.8917. Related photos can be found at Shots and Spots, a Go Northwest! photo blog. 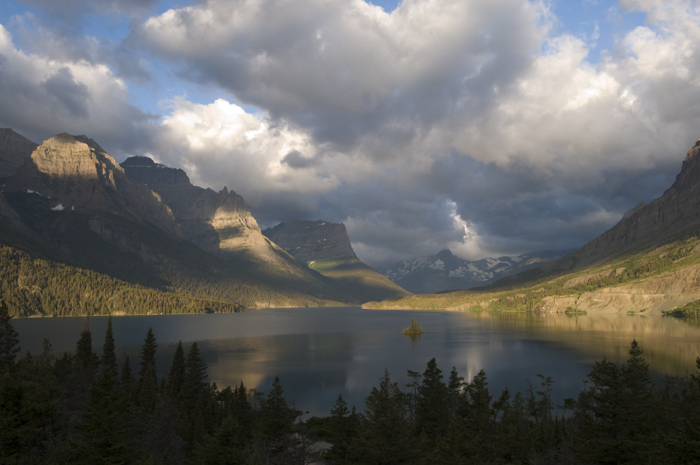 This entry was posted in Glacier National Park, Montana and tagged Glacier National Park, Montana, Wild Goose Island on August 17, 2008 by Jack High. John Reddy, a professional photographer out of Helena, Montana, and I were on a photo shoot in Glacier National Park. Weather wasn’t the most satisfactory. Haze, which probably was smoke blowing in from fires in Washington, filled the valleys and muted the sharpness of the magnificent peaks surrounding us. Clouds, too, obscured the sun and left us with overcast skies. But we had made the best of it that morning shooting waterfalls near the Weeping Wall and were heading back toward the town of Saint Mary on Going-to-the-Sun Road when we came upon the turnoff to Rising Sun Motor Inn and decided it was time to get a bite to eat and plan out the rest of day. The decision was fortunate. Lunch was simple and not particularly noteworthy. But stopping there led to the discovery of a book by a favorite author, James Willard Schultz (1859-1947) who also bore the Blackfoot name of Apikuni. Schultz, while visiting with his Uncle in St. Louis, Missouri in 1877, met first hand the trappers, hunters and adventurers who traveled the Upper Missouri River into Montana. Listening to their stories of adventures inspired him to go to Montana himself where he eventually took up with the Blackfeet, learning their ways and living among them. He eventually became a writer of their stories and authored 37 books about the Blackfeet including his most famous, My Life as an Indian. An inscription written almost 82 years to the July date on which I bought the two paperback copies. This entry was posted in Glacier National Park, Montana and tagged Glacier National Park, James Willard Schultz, Schultz on August 16, 2008 by Jack High.